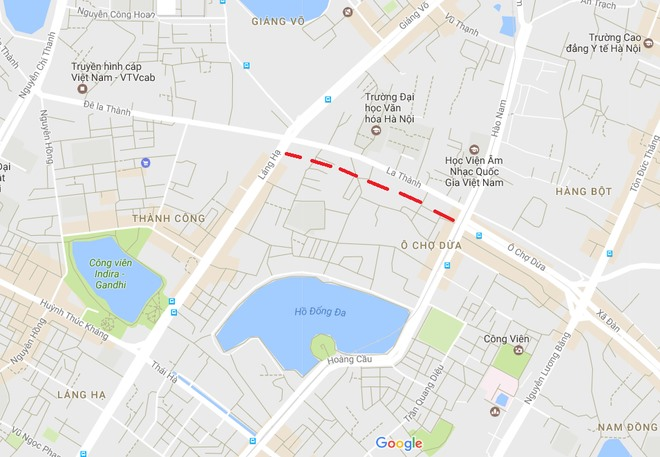 HÀ NỘI — A 50-metre-wide addition to Ring Road No 1 and parallel to Đê La Thành Street in Hà Nội will soon begin construction, according to a newly approved city’s People’s Committee plan. The new road, located in Ba Đình and Đống Đa districts, will start at Hào Nam-Hoàng Cầu crossroad and end at Giảng Võ-Láng Hạ crossroad. The Ring Road No 1 has 50-metre wide cross section. Đê La Thành road’s cross section is 17m. The land between Ring Road No 1 and Đê La Thành Street has the width of 8 to 12m. The crossroads between Ring Road No1 and Đê La Thành Street will be determined following detailed planning along two sides of the Ring Road No 1 approved by local authorities. The city’s People’s Committee has assigned the municipal Department of Planning and Architecture to approve road marking plans and hand over documents to peoples’ committees of Ba Đình and Đống Đa districts to manage the road construction following approved planning. The area around Đê La Thành Street is a traffic bottleneck. A series of transport projects were built within Ring Road No 1 to reduce traffic congestion of the city.